We played The Favourites to finish November at Hitch, by which I mean this week the 137th Trivia Club at Hitch was presented by Fox Searchlight's new film The Favourite! We saw both familiar faces, record setting teams, and new competitors as well! Trivia Classic saw the Fighting Mongoose(s) make their 32nd consecutive appearance at Hitch, and 38th appearance overall in 2018, both more then any other team for the year and the first time in two years that Last Place Team hasn't held the Participation Award! One point behind the Mongoose(s) was Makin' Wookiee, also setting an appearance mark by passing the Trusty Rumpets for the most appearances by one team at Hitch with their 60th appearance! Six and a half points behind Wookiee, was a Tiny Tim's... alumni and partner going by the name Princess Consuelos Banana Hammock! They had two and a half points on Trivia Newton John, which featured an alum of all-time high score holders at Hitch, The West Virginia Losers Club! Rounding out the Top Five was familiar man of records, The Felt Tip! Game Show Games saw Makin' Wookiee grab the TOP TEN in the Countdown Takedown, while the ten eluded all teams in Survey Says Wookiee would still grab another right points! This meant that the man behind the bar had taken a big step got on the Mongoose, who himself had picked up eight points combined for the two games! Finally in a returning Combo Breakdown, at Hitch, it was Trivia Newton John outlasting Makin' Wookiee for eleven points! Tri-Pardo not only saw Makin' Wookiee in the lead, even with the Fighting Mongooses and Trivia Newton John not too far behind but also a late addition of Arnis of The Good Folks from Laramie to the Wookiee side! Trivia Newton John rolled for two points on the first question, while The Felt Tip rolled for sixteen points on the second question, and finally Princess Consuelos Banana Hammock rolled for eighteen points on the third question, giving the field a possible thirty-six points to play with. Getting the first question correct but the other two answers incorrect, Trivia Newton John would lose thirty-four points, the most of any team for the round. Making the biggest gain Makin' Wookiee, continuing a notable night on their sixtieth appearance! This meant that heading into the Trivia Finale , all Makin' Wookiee had to do was answer the final question correctly! The closest team to them, the Fighting Mongoose(s) had even hedged their bet and wagered half their points in case the field bottomed out... two teams would answer the Finale incorrectly as well, but they would not be the top teams before the Finale! Finishing as runner-up on the night, after a good fight would be the Fighting Mongooses! 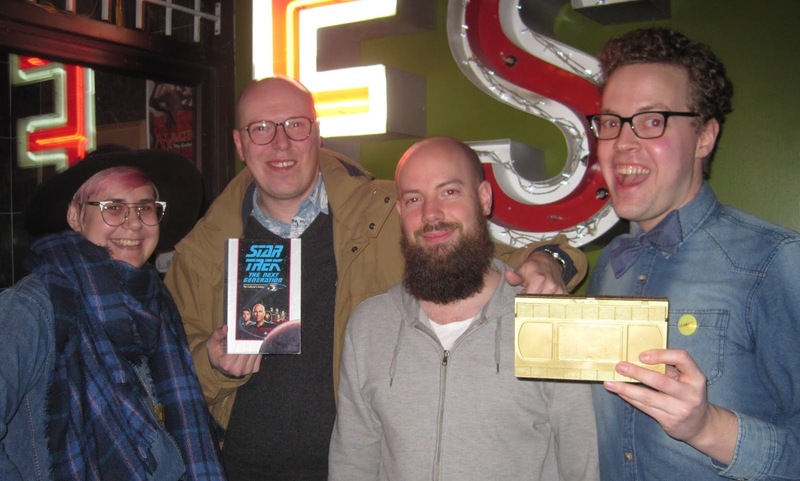 Winning their TENTH GOLDEN VHS, becoming the 14th team in Trivia Club history to do so on the same night that they made their sixtieth appearance to become the all-time leader at Hitch... MAKIN' WOOKIEE! Congrats to Neil, and thank you once again to everyone who came out to compete at Hitch this past Monday! Thank you as well to Fox Searchlight's new film The Favourite for sponsoring the night! We have one more Trivia Club at Hitch for 2018 in TWO WEEKS on December 10th! 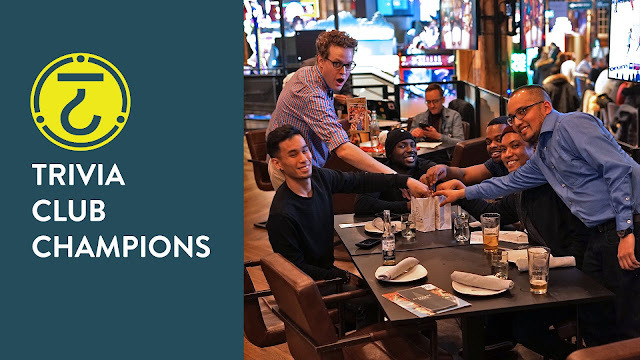 We opened up November with a return to the Three10 restaurant at The Rec Room in Toronto for the fifty-sixth edition of Trivia Club at The Roundhouse! Not only did we have familiar faces from previous nights of trivia, but a host of new teams as well! Who would win on the night? We would have to wait and see! Trivia Classic ended with Quiz In My Pants surprising even themselves with a place in the top spot after the first round! Also getting some sweet prizes were Just Here For the Food and Quiz Knows, as both teams were tied for second! 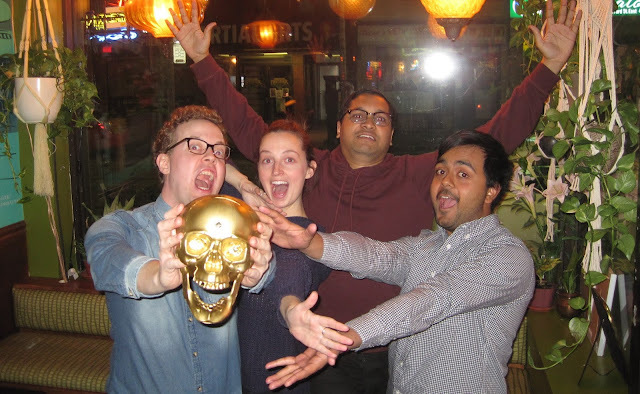 Just one point behind but blanked on the Trivia Royale, were our Trivia Club Royalty at The Rec Room, our reigning Grand Champions Not Turner in fourth! Rounding out the Top Five (top five, top five) was a returning participant with parent, The Dennis Bergkamps! Just outside that Top Five in sixth were One Man Army, making their second appearance at Trivia Club after debuting last week as Orange You A Banana?, while newcomers Blue Crew and Solo 2 rounded out the field! 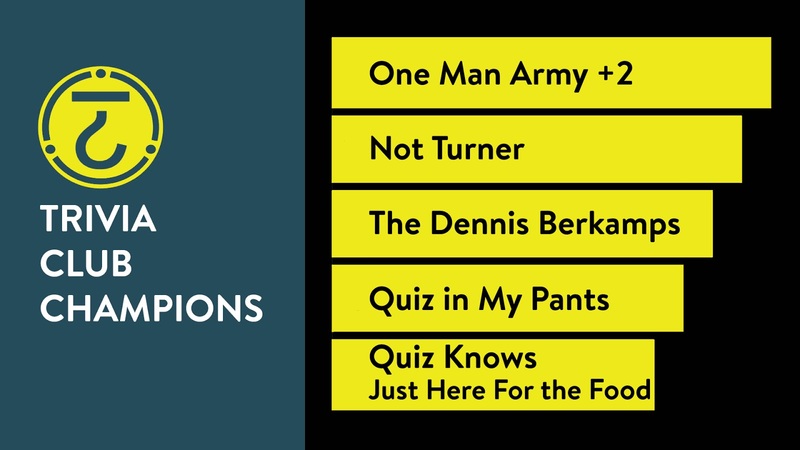 Tri-Pardo was then our second round at The Rec Room, with The Dennis Bergkamps rolling the first question for four points, while Not Turner rolled the second question for TWENTY points and One Man Army was now +2 and rolled the third question for fourteen points! This meant that thirty-eight points were up for grabs! Grabbing those points, all thirty-eight, were One Man Army +2! This put them just two points ahead of Not Turner, who gaining thirty-four points from the second and third questions! In the Trivia Finale , it was then a question of which teams would go all-in, with One Man Army +2 initially wanting to go half-in, before adding the other twenty-five points for a potential triple digit score! With all other teams going all in or more, it was important for anyone to get that last question correct… let along the teams near the top of the score card! It would be a good thing that One Man Army +2 did in fact go all in, as they would finish the night with 100 points and ONE MAN ARMY +2 would win their first GOLDEN VHS CHAMPIONSHIP! Finishing as runners-up would be Not Turner, close behind with 96 points! Congrats once again to the wonderful One Man Army +2, and thank you to everyone who came out to compete at The Rec Room this past Tuesday! We’ll see you again NEXT TUESDAY for more the Greatest Game Show in Ontario on November 20th! Click here for more photos of the event's CHAMP on Facebook! 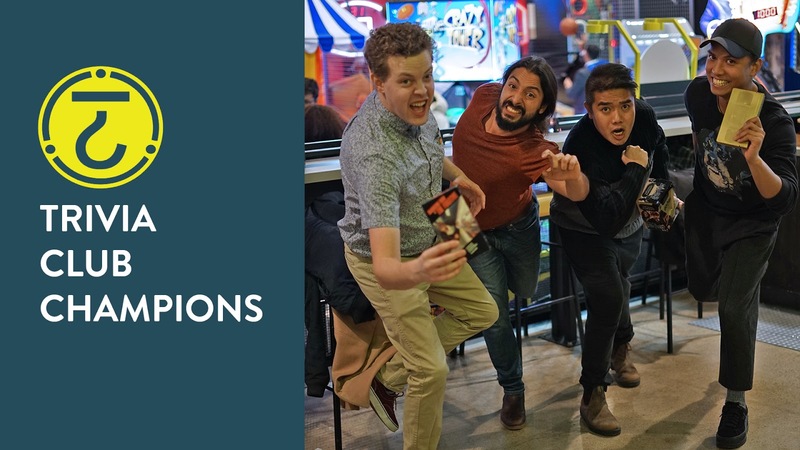 The third last edition of Trivia Club at Hitch for 2018 saw both familiar teams return and also newcomers enter the field! Who might walk away from the 136th edition of our Black Label location with the Golden VHS? Leading Trivia Classic , our first round, were the Fighting Mongooses! Our returning Golden VHS winners held a four and a half point advantage on the Good Folks from Laramie Cigarettes, who were in second place and sticking around for the winter after a summer away! A point behind were Old Milwookiee, followed by newcomers The Swingerzzz, and rounding out the Top Five (top five, top five) The Sinking Ship! This meant that Game Show Games held potential for the game to turn, and first up Old Milwookiee would almost nail the Countdown Takedown for the TOP TEN! The Swingerzzz would also get eight big points! Then in Survey Says it was The Swingerzzz with the TOP TEN, while Laramie Cigarettes nabbed eight points! Heading into the Combo Breakdown, the Mongooses who Fight still held the lead, but Laramie Cigarettes were close behind, with The Swingerzzz now hot on their tale! In the Combo Breakdown, Old Milwookiee would grab ten points but would finish third. Ultimately the Fighting Mongooses would outlast the Good Folks from Laramie Cigarettes, and decide not to double their Combo but still earn fifteen points as the last team standing! With all that settled, the Fighting Mongooses brought their lead into Tri-Pardo but the night was far from over! The first question was chosen by Old Milwookiee and rolled for four points, while The Swingerzzz chose the second question and The Good Folks chose the third question and both teams rolled for TWENTY! This meant that forty-four points were up for grabs, naturally. 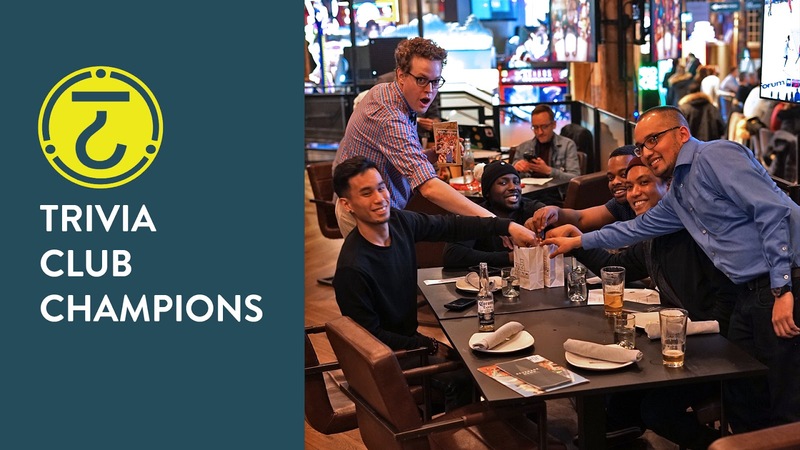 The four points proved some of the hardest however as The Swingerzzz and Good Folks would answer the first question correctly, while everyone else lost points. The field would also lose points on the second or third questions, either cancelling out big points or digging a deeper hole! Save for Old Milwookiee! They took a swing on the second question, and though the first lost them points the net result saw Old Milwookiee in the lead before the Finale question! Winning their SIXTEENTH GOLDEN VHS and fourteenth at Hitch... THE GOOD FOLKS FROM LARAMIE CIGARETTES! Congrats to the Good Folk, Arnis, and thank you once again to everyone who came out to compete at our early November edition of the Greatest Game Show in Ontario! 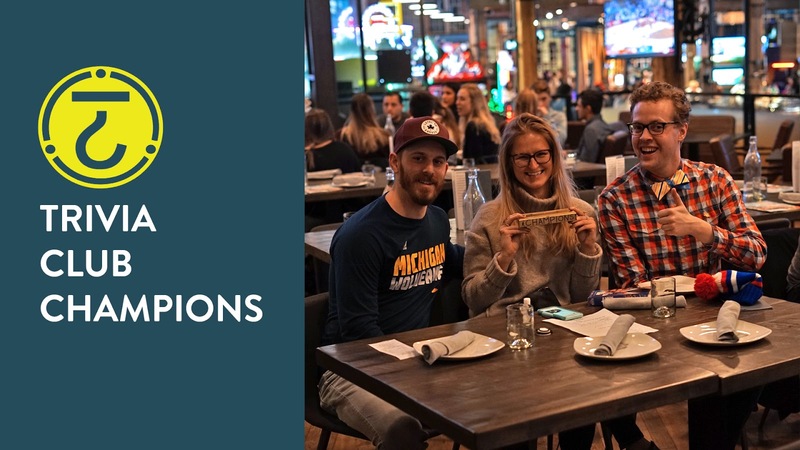 We will see you again in TWO WEEKS on November 26th for the penultimate edition of Trivia Club at Hitch for 2018!